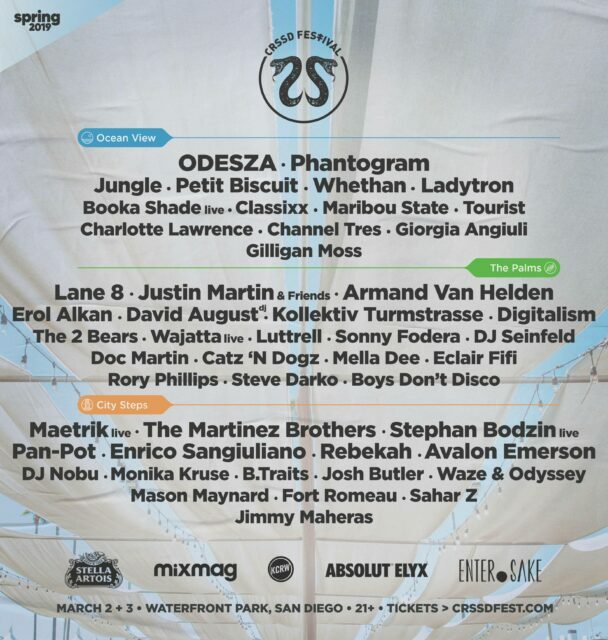 With the gleaming San Diego festival utopia known as CRSSD on the horizon, EARMILK is here to pick apart the lineup and shine the spotlight on a few artists you simply cannot miss. Making his CRSSD debut, French wunderkind Petit Biscuit will have revelers muttering to strangers, "I'm not crying, you're crying." His debut album Presence, which features Lido and Cautious Clay, among others, was released in 2017 to critical acclaim, solidifying himself as one of the hottest artists in future bass. His music expertly toes the line between sun-kissed and poignant, and his live sets are as unique as they come. Did I mention he's only 19-years-old? Take note: DJ Seinfeld is not a flash in the pan artist with a quirky name. There are no gimmicks here; this dude is one of the most forward-thinking beatmakers in the underground scene. His diverse and trailblazing body of work touches on tech, breaks, acid, jungle, and left-field house, among other sub-genres, remaining under a wonky techno umbrella without ever becoming unpleasantly experimental. Bask in the glory of his latest Boiler Room set below. Electronic duo Classix are set to bring their bubbly brand of electropop to the fest and will be an ideal act to frolic to under the California sun. You might find yourself with broken ankles and no voice after their set, because they are bound to drop at least one of their bouncy remixes of an old school anthem, like their jaunty rework of Shwayze's 2008 hit "Buzzin'." Electronic music linchpins Digitalism are primed for a monster performance. They haven't missed a beat since their debut 2007 album Idealism, consistently pumping out their unique blend of house, disco and indie rock to international acclaim. Check out the German duo's recent remix of Uppermost's "Better Days Ahead" below, which boasts groovy synths and some masterful filter work, among other next-level production techniques. Channel Tres came out of nowhere with his self-titled debut EP last year, and it – for lack of a better term – slayed. Flaunting an inimitable blend of deep house, hip-hop and urban soul, he rocketed onto the contemporary radar and, within one year, crystallized himself atop Los Angeles' fastest-rising electronic acts. Don't sleep on his single "Jet Black," his sultry slow-burner that moonlights as a dark, fierce 105 BPM hip-house banger.